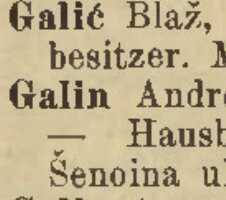 In Croatia, Galin families are Croats (from Bjelovar ). In the past century, relatively most of Croatian residents bearing this family name were born in Bjelovar and Zagreb. About 30 people with faimily name Galin live in Croatia today, in 14 households. There were 60 of them in the middle of the past century, and their number halved. They are located and four other Croatian places, mostly in Zagreb (15), Hum Zabocki (<10), Leticani (<10), Krapina (<5), and in Bjelovar (<5). Family name Galin (including: Gallien , Gallin , Galien , Gahlin , Galinn , Gallyon and Galyn ) is present in 57 countries worldwide. The family name "Galin " is used by some 10000 people in Russian Federation , about 1000 in the United States , and some 900 people in France. "Galien " is used by some 300 people in France , about 100 in the United States , and some 100 people in the Netherlands. "Gallin " is used by some 400 people in the United States , about 400 in France , and some 100 people in Germany. In the sources analysed in the project Acta Croatica so far, the name is mentioned few times, the first time 1902 in source Hartmann's General List of Apartments in Zagreb.